WHY ORGANISATIONS SHOULD THINK ABOUT GOVERNANCE? GGGS: WHAT IS IT ALL ABOUT? Defining and implementing a good governance is a long journey, one of those that require engagement, commitment and long term thinking and leadership, one of those you will never find a map or GPS to follow but one of those for which it is priceless to get a compass.Indeed governance is a multidimensional and complex issue involving many key areas to think about: policy, people and process. Furthermore, the specific nature of grassroots sport means we need models of good governance that are relevant for our organisations and for our sector! Here are some of the dilemmas and challenges we have been identifying together with GGGS partners and participants during the trainings. Respect the Democracy and accountability principles DEFINING THE OBJECTIVES OF THE ORGANISATION“When thinking about good governance we shall not focus too heavily on procedures. Good governance has most and foremost to deal with a way of being, organizing and thinking! Procedures and tools should be seen as a mean of and not a purpose in itself! They should in fine serve the goal and vision of the organisation. The vision/mission should remain the most important things for an organisation, its compass, its ‘raison d’être’.”Jean Camy, University of Lyon, France “We as a board need to define how to drive a common goal and set a common direction”.Dorte With, DGI, Denmark ENSURING BALANCE OF POWER“Ensuring a balance of power is a crucial way to legitimate the organisation. Our challenge as organisations is therefore to establish a shared power between elected members but also between elected and staff member”Jean-Claude Arnaud, member of ISCA Executive Committee. “We don’t currently look at is the effectiveness of the board as a whole. We look at individual roles but not the sum total of these roles and how clubs need to ensure a balance of power on the board and effective operations as a team.”Patrick McGrattan – Belfast City Council, United Kingdom. The Good Governance in Grassroots Sport project is receiving support from the European Commission, Education and Culture DG, under the "2011 Preparatory Action in the Field of Sport". “Grassroots sport is focused on opportunities, encouragement and participation in the community ..."
"Grassroots sport covers all sport disciplines practiced by non-professionals ..."
"Good governance is characterized by a high degree of openness, transparency, accountability and democracy." "We believe in grassroots sport as a way of personal growth." "Political leaders in sport have to believe in the essential values, knowledge of the sports world, personal abilities and ideas." The GGGS project is receiving support from the European Commission, Education and Culture DG, under the “2011 Preparatory Action in the Field of Sport”. 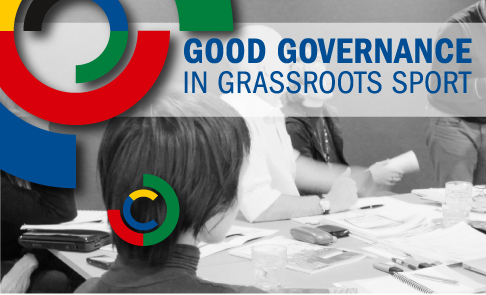 Good Governance in Grassroots Sport project (GGGS) is a transnational project that increases organizational capacity for good governance by focusing on transparency and accountability, particularly at the grassroots sport association level. Transparency is chosen as it should be a defining feature of grassroots sport NGO management, given the public purposes these NGOs serve and the high degree of interdependence vis-à-vis Public Authorities. It is also the key focus of the European Council Work Plan on Sport from May 2011 when it comes to good governance. Designing and implementing a sustainable, state-of-the-art European non-formal education for “Good Governance in Grassroots Sport”, targeting organizational top leaders, and based on the results from the above mentioned evidence- and knowledge base. The project will develop and deliver a unique education programme targeted specifically for grassroots sport and with a combination of high-level experts (Council of Europe, University of Cassino,Transparency International, City Mayors), site visits, and peer-lead learning. The primary target group of GGGS are managers, politicians and leaders of national and European level sport organisations, from project partners and beyond. As actors of change, they will reach out to other stakeholders and facilitate the improvement of conditions and possibilities for the ultimate target group.